Something rather unusual happened this week – Christmas happened. No I’ve not gone loopy, but rather I entered the whimsical world that is Jo Malone‘s London Townhouse. The luxury brand this week hosted their Christmas in July event, giving a sneak peak into their decadent festive range. As I’ve been blogging for less than a year, this is my first ‘season’ of Christmas in July, and Jo Malone sure set the bar high with their Frosted Fantasy event. Beautifully laid out on a long table was the full festive offer – a sumptuous array of fragrances, luxurious candles and bathing products, which were complemented by stunning ribboned boxes trimmed with frosted berries. One of my favourite stocking fillers was the Cherry and Clove scented bauble in the top image above. The star product for me was the Frosted Cherry and Clove candle, and it comes as an addition to their previous Christmas scent of Pine and Eucalyptus. The cherry red glass is hand etched with a frosted design and the warm distinctive scent will give any home a luxurious festive smell this Christmas. As well as the festive offering, we were invited to try our hand at making a scented Christmas Wreath, or choose a stunning Jo Malone gift box to be decorated and personalised with glittering stencils. 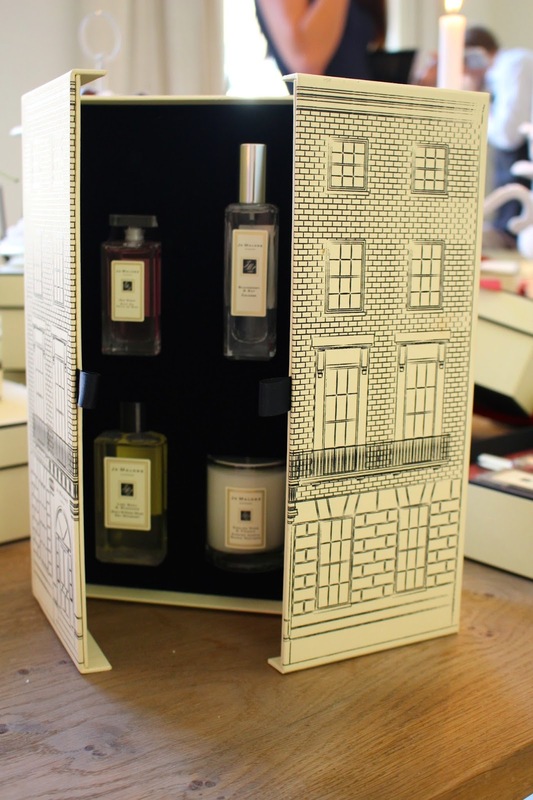 The gift box in the image above right is designed to emulate the Jo Malone Townhouse and is filled with not so mini minis of the favourite products including colognes, candles and perfumes. Within the next room was the most opulent, lavish Christmas table you could imagine, adorned with white and crimson livery and accessorised with a sprinkling of snow, frosted cherries and of course an array of candles, crackers and gift boxes. As though I wasn’t breath taken enough by the beauty of the event, Jo Malone trumped it all by revealing an Indoor Ice Rink in the ‘lounge’ room! Can you believe it! Set in the middle of a winter wonderland and adorned with some hunky male models, the ice rink was truly the pièce de résistance of this fabulous event. I didn’t think it was possible but even leaving the event onto the unusually scorching hot streets of London, I’m already counting down the days til Christmas, and hoping Santa leaves a certain cream and black box under my tree! The collection is available from early November, and will be sold online as well as in their stores.